Sideways Annual #1 Review – AiPT! Sideways Annual #1 is a direct continuation of the events from Sideways #9. Writer Dan Didio is joined by co-writer Grant Morrison who returns to characters he breathed fresh life into: the New 52 version of Superman — in all his cuffed jeans and t-shirt glory — as well as the Seven Soldiers of Victory. 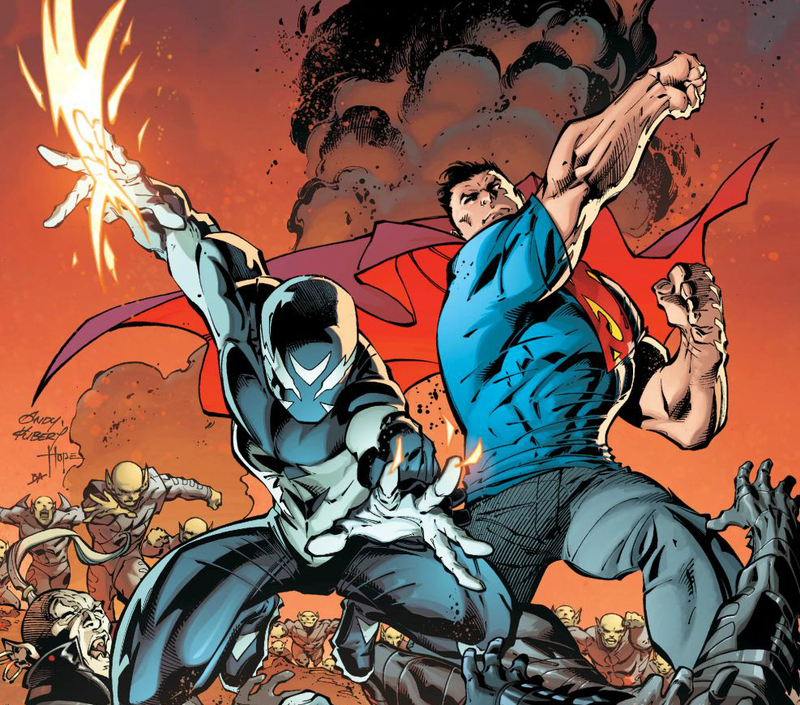 Sideways teams with this Superman to aid him in saving the Seven Soldiers and thwart Perrus’ dark reign over the Unseen and their warped universe. The issue feels like a typical Sideways outing, save for the extended pages, essentially allowing Didio and Morrison breathing room to flesh out the story at hand. Sideways Annual #1 effectively serves as the final chapter of the current story arc for Sideways, while simultaneously opening new possibilities for the Unseen and Superman. The story is well paced; however, the focus is placed squarely on the mysterious Kryptonian and the Seven Soldiers. Sideways issues #8 and #9 were positioning Perrus to be a worthy threat, only to have him beaten by falling debris. The demonic villain who ran roughshod over the Unseen was beaten… by rubble? Sadly, Perrus became an afterthought in the issue. It felt as the writers had to quickly wrap up the Perrus angle to gear the issue towards other characters meant to garner readers’ attention. What began as an A story arc promptly descended to a C story concluded in two panels. Despite a few setbacks, the issue does manage to steer the ship correctly. With each new issue Sideways continues to grow as a hero and fleshed out character in his own right. What began as a pure teleportation ability is being used in unique ways. The edges of the dimensional tears can be used as a cutting tool, and the sheer scope of Sideways portals are growing. The sword that pierced Gloriana was Sideway’s handy work. Sideways opens a gateway directly in the swords path, leading to a second portal positioned directly behind Gloriana. The result is similar to Spider-Man villain The Spot. More importantly, Sideways is budding into a respectable hero. Of all of DC’s “New Age of Heroes,” Sideways feels like he can seamlessly fit into the rest of DC proper. Readers are left with two new narrative possibilities to consider. First, there are the Unseen, twisted versions of DC’s characters seeking a new home. The issue closes with the Unseen finding a new home in the current DC continuity Earth. Secondly, there is the New 52 Superman. Clark flashes back to his original origins — at first glance, this appears to be the real Superman that first filled the early pages of DC’s New 52 initiative. How his existence is even possible remains to be seen. Rebirth seemingly removed the “New 52” version of the Superman. However, Sideways’ abilities allow him to transport through time, space, and dimensions. Subsequently, Sideways’ effects on the space-time continuum allow New 52 Superman’s existence to remain a possibility. The issue leaves the door open for future adventures of New 52 Superman; before Sideways makes his final teleportation, Clark’s final words foreshadow his future endeavors: “Imagine traveling from world to world.” He continues, “I might start by repairing the Dimensional Ark.” DC is no stranger to exploring the multiverse, but the possibilities for this particular Clark Kent remains to be seen. Sideways Annual #1 does have a few minor hiccups but successfully continues to build on the ongoing journey of Derek James, DC’s neophile hero.